The Pune city in Maharashtra is in the news for a very bizarre situation. Last year, Pune Police made the use of helmet mandatory for the two-wheeler riders. Since then, a major part of Pune’s public has been protesting against the new law. The law came into effect on the 1st January 2019 and the cops have issued more than 9,500 fines to the motorists for not adhering the new mandatory helmet rule. 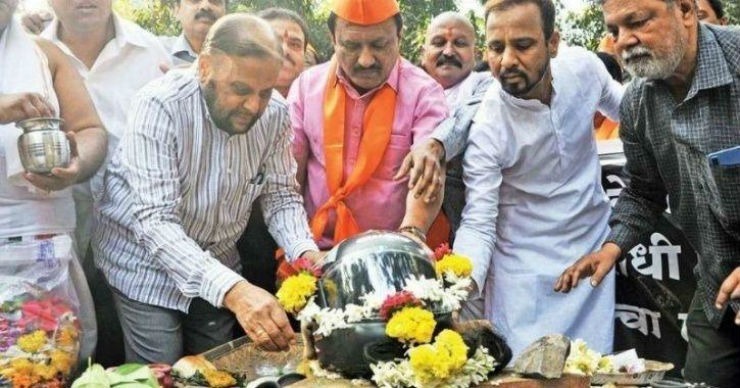 Pune’s newly formed group ‘Helmet Sakti Virodhi Kruti Samiti’ conducted an elaborate funeral ceremony of a helmet a crematorium to protest against the new ruling. The funeral was conducted on the 10th day of the ruling coming into effect. The whole event was headed by a Shiv Sena leader Mahadev Babai. He slammed the police administration for the fiasco and making the helmet compulsory for all the two-wheeler riders. The city police of Pune came with the rule after the streets of Pune saw as many as 184 deaths due to the two-wheeler related accidents. Other leaders like Anil Shirole, who is an MP from Pune said that they are opposed to the public safety rules but the mandatory helmet ruling is little over the top. The Pune residents earlier protested against the helmet ruling by riding without the helmet from Patrakar Bhavan to the police commissioner’s office. There were hundreds of protestors riding in the convoy when the cops present nearby clicked pictures of the riders without a helmet and then issued electronic challans to the culprit. The traffic police caught as many 6,105 riders without the helmet and 3,414 riders were fined after catching them on the CCTV footage. Around 50 riders from the rally were issued a fine. These figures are from 5th January and we are sure that these numbers have swelled up by now. The head of the newly formed committee then said that the helmets can be made mandatory for the highways but they are not needed inside the city limit where the maximum speed attained by the two-wheelers 20-30 km/h. The protestors even said that they will start wearing their pagdis to get exempted from fines. Interestingly, Sikhs are exempted from wearing the helmet as helmets can’t fit their turbans.